An FTP client normally hides files whose names begin with a dot. You want to still access such files. 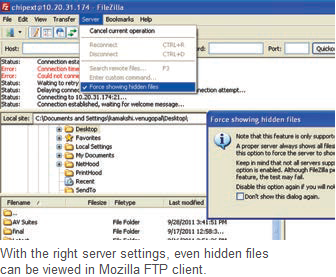 If you use FileZilla as FTP client, open the “Server | Force showing hidden files” command. Confirm with “OK”. Some servers do not accept this option and show an incorrect file list or no file list at all. In such a case, deactivate the option.